Liubo (Chinese: 六博; pinyin: liù bó; Wade-Giles: liu po; literally: "six sticks") is an ancient Chinese board game played by two players. For the rules, it is believed that each player had six game pieces that were moved around the points of a square game board that had a distinctive, symmetrical pattern. Moves were determined by the throw of six sticks, which performed the same function as dice in other race games. The game was invented no later than the middle of the 1st millennium BCE, and was immensely popular during the Han Dynasty (202 BCE - 220 CE). However, after the Han Dynasty it rapidly declined in popularity, possibly due to the rise in popularity of the game of Go, and it eventually became almost totally forgotten. Knowledge of the game has increased in recent years with archeological discoveries of Liubo game boards and game equipment in ancient tombs, as well as discoveries of Han Dynasty picture stones and picture bricks depicting Liubo players. It is not known when the game of Liubo originated, although according to legend it was invented by Wu Cao (烏曹, called Wu Zhou 烏胄 in the early 2nd century CE Shuowen Jiezi dictionary), a minister to King Jie, the last king of the Xia Dynasty, who according to traditional chronology reigned 1728-1675 BCE. Although there is no archeological or reliable documentary evidence to support the view that Liubo dates back to the Shang Dynasty (1600-1046 BCE), early Chinese records do indicate that Liubo was already a popular game by the Warring States period (476-221 BCE). For example, the Records of the Grand Historian records a speech made during the reign of King Xuan of Qi (reigned 319-301 BCE) that claims that the capital city of Linzi was so wealthy that its citizens were all able to indulge in activities such as playing musical instruments, cockfighting, dog racing, playing Liubo and playing kick ball. Sides are taken; they advance together; keenly they threaten each other. Pieces are kinged and the scoring doubled. Shouts of ‘five white!’ arise. The earliest Liubo boards to have been discovered are a pair of ornately decorated stone boards from a 4th-century BCE tomb in the royal tomb complex of the State of Zhongshan at Pingshan in Hebei. The game reached its greatest popularity during the Han Dynasty, as is evidenced by the discovery of many examples of Liubo boards or sets of Liubo game pieces as grave goods in high status tombs dating to the Han Dynasty. Pottery or wooden figurines of players with model Liubo boards have also been discovered in some Han tombs. 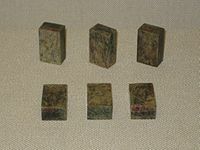 Engraved picture stones (畫像石) and moulded picture bricks (畫像磚) that were widely used to decorate tombs and temples during the Eastern Han period (25-220 CE) also frequently depict people playing Liubo, sometimes as a small part of a complex scene depicting many different activities, but sometimes as the focal point of the scene, with the players attended by servants and playing in the cool of a pavilion. Some picture stones and engravings on stone coffins, especially those from the area of modern Sichuan and Yunnan provinces, show two winged immortals playing Liubo on a mountain, usually as part of a larger scene depicting the Queen Mother of the West and various mythical animals. After the end of the Han Dynasty the game seems to have lost its popularity, and there are no known examples of Liubo funerary ware or depictions of Liubo playing later than the Jin Dynasty (265-420). Although the game is still occasionally referred to in some historical sources and in poetry as late as the Tang Dynasty (618-907), it seems that Liubo had been largely displaced by the game of Go. By the time of the Yuan Dynasty (1271-1368) all knowledge of the game of Liubo had been lost, and it is only with the archeological discoveries of recent years that the game has become better known. There is some evidence that the game of Liubo spread to beyond the confines of China. The Old Book of Tang mentions that Tibetans enjoyed playing both the game of Go and Liubo, but although ancient Tibetan Go boards have been discovered, no examples of Tibetan Liubo boards are known. 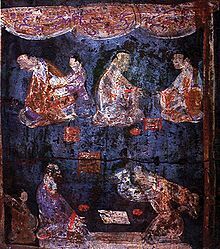 The Chinese version of the Mahayana Mahaparinirvana Sutra also mentions the playing of several games, including Liubo, which some have taken as evidence that Liubo was transmitted to India. However, to date no examples of Liubo boards have been found outside of China. All excavated boards have the angular V-shaped marks at the corners and L-shaped marks at the center of the edges, as well as the central square and T-shaped protrusions, and most boards also have four marks (usually circular but sometimes a decorative pattern) between the corner mark and the central square. However, on some boards each circular mark is replaced by a straight line joining the corner mark to the corner of the inner square, and in a few cases there is no mark between the corner and the square at all. The six black and six white game pieces are the main game pieces to be moved around the board, and similar sets of cubic or cuboid game pieces made from ivory, jadeite or rock crystal have been found in several other tombs. In at least one case the game pieces are not distinguished by colour, but by having an engraving of a tiger on the pieces of one set and an engraving of a dragon on the pieces of the other set. The twelve long rods are two sets of the six throwing sticks that the players use to determine their moves, and which the game is named after (Liubo="six sticks"). 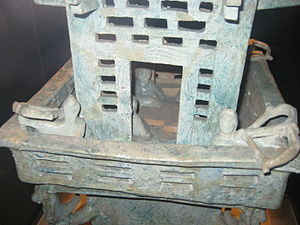 Most Han stone pictures of Liubo show the players throwing sticks onto a mat between themselves (with the Liubo board to the side of the mat), and ceramic model Liubo sets such as the one excavated in 1972 from Lingbao in Henan province show six sticks lined up neatly between the two players. Sets of thirty rod-shaped counting chips have also been found in association with Liubo sets from other tombs. However, the twenty ivory game pieces and the eighteen-sided die in the Mawangdui set are not typically associated with Liubo boards in other tombs, and it is possible that they were not used for playing Liubo, but were equipment for a different game. A similar eighteen-sided die with numbers "1" through "16", "win" and "take a drink" was found in association with two sets of twenty copper, coin-shaped tokens (one set inscribed "Number 1" through "Number 20", and the other set inscribed with three-character lines of poetry) in a Han tomb at Mancheng County in Hebei. No Liubo board or Liubo game pieces were found in the tomb, and because of the inscription "take a drink" (酒來) on one face of the die, the die and sets of tokens are supposed to have been used for a drinking game. 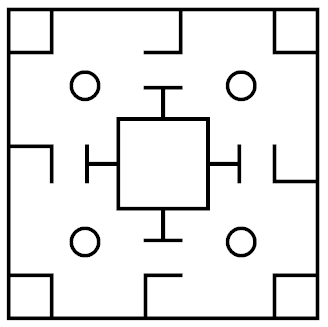 Method of play: Two people sit facing each other over a board, and the board is divided into twelve paths, with two ends, and an area called the "water" in the middle. Twelve game pieces are used, which according to the ancient rules are six white and six black. There are also two "fish" pieces, which are placed in the water. The throwing of the dice is done with a jade. The two players take turns to throw the dice and move their pieces. When a piece has been moved to a certain place it is stood up on end, and called an "owl (梟or驍) ". Thereupon it can enter the water and eat a fish, which is also called "pulling a fish". Every time a player pulls a fish he gets two tokens, and if he pulls two fish in a row he gets three tokens [for the second fish]. If a player has already pulled two fish but does not win it is called double-pulling a pair of fish. When one player wins six tokens the game is won. The ancient Greater Bo used six sticks, whereas Lesser Bo used two dice. Nowadays there is no-one who knows how to play, but in those days when it was played it used one die and twelve game pieces. It had very little skill, and was not worth playing. Most game historians think that Liubo was a race game, and that players moved their six games pieces around the marks on the board. However, others consider Liubo to have been a battle game played with dice or throwing sticks. There have been several attempts to reconstruct the rules of the game, most notably by Lien-sheng Yang, who discusses the game as it was possibly played on TLV mirrors. Yang theorizes that a player’s piece would start on an L-shaped mark and try to move to a V-shaped corner mark depending on the throw of the sticks. Certain throws would allow a player's piece to move into the center and ‘kill’ the opponent’s piece if it was already there. Once in the center, a piece could begin to block the enemy’s pieces from taking a square. For each block one would gain two points. One could also attempt to recover one’s pieces after they are blocked, and would gain three points for doing this. If one failed to win after having blocked two men, then the opponent would gain six points and win the game. The first player to six points would win the game. Jean-Louis Cazaux has reconstructed similar rules for playing Liubo. An implementation of these reconstructed rules as a playable computer game has also been attempted. A variant of Liubo in which dice were used to make the moves was called Chupu (樗蒲) or Wumu (五木). In Korea the traditional game of jeopo 저포 (hanja: 樗蒲 ) is still played, on a board that is not similar to a Liubo board. There have been attempts to relate Liubo to other board games, and in particular some Chinese scholars believe that Xiangqi (Chinese chess) was based on Liubo. 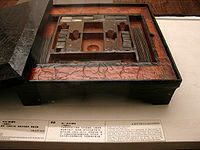 Some Chinese game historians believe that Xiangqi is not related to Western chess, but was based on Liubo, whereas others have suggested that Liubo was transmitted from China to India during the Eastern Jin (317-420), where it developed into Chaturanga, which was the ancestor to both Western chess and Chinese chess. Although many western game historians reject the claim that Xiangqi or other chess variants derive from Liubo, Jean-Louis Cazaux argues that Liubo could have been transformed from a race game to a battle game, and it could then have become Chinese chess. 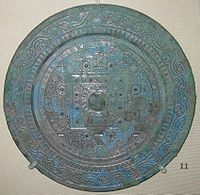 The pattern found on the surface of Liubo boards is also found on the most common type of Han Dynasty bronze mirror, known from their distinctive markings as TLV mirrors. There is some debate over whether the Liubo pattern on these mirrors was simply decorative, or whether it had a ritual significance, or whether perhaps the mirrors doubled as portable Liubo game boards. Zhou Zheng has pointed out that one TLV mirror dating to the reign of Wang Mang (9-23) has an inscription that includes the words "Carved with a Liubo board pattern to dispel misfortune" (刻具博局去[祛]不羊[祥]), which suggests that the main purpose of the Liubo pattern on mirrors was ritual, and that the pattern had a special significance beyond game-playing. The Liubo pattern is also sometimes found on the reverse of Wu Zhu coins. Such coins were not used as currency but were probably lucky charms. In 1897 a Han Dynasty stone sundial was discovered in Inner Mongolia which had been overcarved with a Liubo board pattern. The only other complete Han dynasty sundial, in the collection of the Royal Ontario Museum, also has a Liubo pattern carved on it. 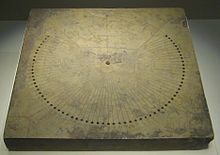 It may be that the sundials were repurposed as Liubo boards by carving the Liubo pattern over the original sundial markings, or it may be that the Liubo markings were added for some unknown ritual purpose. In 1993, a wooden board with turtle divination diagrams and prognostications on one side and a Liubo diagram and forty-five prognostications on five topics on the other side was excavated from a late Western Han tomb at Yinwan in Donghai County, Jiangsu. The Liubo diagram is too small to have been used for playing Liubo, and is covered with the sixty terms of the sexagenary cycle which are written all along the lines of the Liubo diagram, in a similar way that the turtle diagram on the other side of the board is filled with the sixty terms. The prognostications under the Liubo diagram are headed with one of nine terms that correspond to the words of an enigmatic, mnemonic rhyme about Liubo written by Xu Bochang (許博昌) during the reign of Emperor Wu of Han (141-87 BCE); Lillian Tseng (Zeng Lanying) argues that these are the names for particular points on the board (the two lines of the "V" mark, the two lines of the "L" mark, the two lines of the "T" mark, the circle or line between the corner and the central square, the outside edge of the central square, and the inside of the central square). Schematic diagram of the Yinwan Han dynasty Liubo divination diagram, showing the positions of the sixty terms of the sexagenary cycle (following the corrections of Zeng Lanying) and examples of the nine board positions: A=fāng 方 "square"; B=lián 廉 (pàn 畔) "edge"; C=jié 楬 (jiē 揭) "lift"; D=dào 道 "path"; E=zhāng 張 "stretch"; F=qū 曲 (jiǔ 究) "bend"; G=qū 詘 (qū 屈) "curve"; H=cháng 長 (xuán 玄) "long"; I=gāo 高 "tall" (terms used in Xu Bochang's rhyme given in brackets if different). Li Xueqin has suggested that the board was used for divination by matching the day to be divined to the corresponding sexagenary term on the Liubo diagram, and then reading off the corresponding prognostication according to the position of the sexagenary term on the Liubo diagram. However, Lillian Tseng points out that the divination could also be done the other way round, by looking for the desired prognostication (for example an auspicious marriage day), and then all the days on the Liubo board that were written on the position corresponding to the term heading the prognostication would match the desired prognostication. 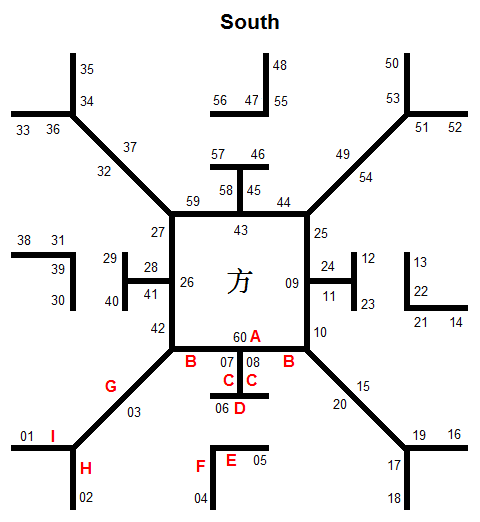 It has been theorized that the placement of the sixty sexagenary terms on the points of the Liubo divination diagram indicate the possible positions for placing pieces when playing Liubo, and that the sequence of the terms across the divination diagram reflects the path to be followed around the board when playing the game (starting at the north-east corner and ending at the north side of the central square). King Mu of Zhou (reigned 977-922 BCE), who according to the apocryphal Travels of King Mu once played a game of Liubo with a hermit that lasted three days. Duke Min of Song (宋湣公), who in 682 BCE got into an argument with Nangong Wan 南宮萬 whilst playing Liubo with him, and was killed by Nangong Wan when he hit the duke with the Liubo board. King Anxi of Wei 魏安釐王 (reigned 277-243 BCE) and his half-brother Lord Xinling of Wei 信陵君 (died 243 BCE). Once when the two of them were playing Liubo a message came that the beacons on the northern border had been lit; King Anxi wanted to stop the game and discuss the situation with his ministers, but his brother told him not to worry as it was only the king of Zhao on a hunting trip, and so they continued playing. The king was worried and could not concentrate on the game, but after the game was over news came that it was indeed the king of Zhao out hunting. Jing Ke (died 227 BCE), the failed assassin of Qin Shi Huang, once had an argument with Lu Goujian (魯句踐) over a game of Liubo, and had to flee for his life. Emperor Jing of Han (reigned 156-141 BCE), who when he was crown prince became angry during a game of Liubo with the Prince of Wu, and threw the Liubo board at the prince, killing him (cf. Rebellion of the Seven States). Liang Ji (died 159), who according to his biography was fond of playing Liubo. Li Guangyan (761-826), a Uyghur general who was presented with a girl who was trained in the arts of "song, dance, music and Liubo". Liu Min (895-954), a Shatuo Turk and founder of the Northern Han kingdom, liked to play Liubo and gambling games when he was young. Confucius famously did not approve of Liubo. In the Analects he grudgingly allows that playing Liubo and Go is better than being idle, and according to the Kongzi Jiayu (Family Sayings of Confucius) he stated that he would not play the game as it promoted bad habits.